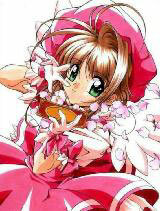 You are going to Watch Cardcaptor Sakura Episode 5 English dubbed online free episodes with HQ / high quality. Stream Anime Cardcaptor Sakura Episode 5 Online English dub Sakura, Panda, and a Cute Shop, On the way to school, Sakura meets Maki Matsumoto who is opening a stuffed doll shop called Twin Bells. Sakura and her friends visit the shop after school to find most of the merchandise unpacked, so they offer to help. Chiharu Mihara, who has a fondness for stuffed animals, buys a stuffed panda, but it disappears shortly after taking it home. Sakura discovers the panda back in Twin Bells and Maki explain the reason for opening the shop and her business has been plagued by mysterious happenings that almost forced her to close down. While Tomoyo distracts Maki in the back, Sakura and Kero search the shop to find The Jump, which escapes with all the stuffed dolls in the shop. At Penguin Park, The Jump grows into a giant by absorbing the stuffed dolls, but it knocks itself out after it trips and falls allowing Sakura to capture it.